Gurjeet Dhesi gained his BSc in Physics from University College London with first class honours in 1984. He then moved to the University of Birmingham where his postgraduate studies were in Theoretical Physics. He completed his PhD in Mathematics (Theoretical Physics) in 1988. Further to this he also holds a Masters in Business Analysis with distinction from the University of Leicester. 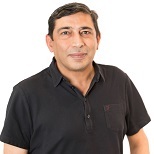 Gurjeet is an active and experienced PhD supervisor in the area of Quantitative Studies applied in the domain of Finance, Business and Economics and has published in a wide range of subject areas. Dhesi, G Non stationarity of high order return distribution moments and their Irrational fractional Brownian Motion modelling. In: EURO 2018, 8th - 11th July 2018, Valencia.